Huge Savings Item! Free Shipping Included! 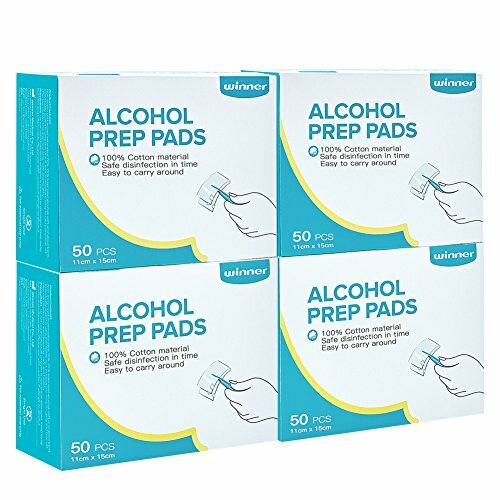 Save 11% on the Winner Ultra Large Alcohol Wipes, 100% Soft Cotton Prep Pads Lock Abundant Liquid, 200 Count (Box of 4) by Winner at Dencats. MPN: 501 051. Hurry! Limited time offer. Offer valid only while supplies last. Winner Medical-Enjoy Healthy Life -Winner Alcohol wipes are made of 100% natural cotton fabric and saturated with 70%-75% safety alcohol. -Winner Alcohol wipes are made of 100% natural cotton fabric and saturated with 70%-75% safety alcohol. Alcohol swabs are ideal for all-purpose disinfections, such as preparation of prior to injection, disinfections for jewelries, toys, hands, electronics, first aid antiseptic wipes which provides sting relief and helps prevent infection in minor cuts, scrapes and burns. Precautions: Not for children under 2 years. Please use with caution if allergic to alcohol. Sterile alcohol wipes are made of 100% cotton fabric with abundant liquid. Ultra large size alcohol pre pads 4.33" x 5.91", easy to clean large area. 50 Count. Each alcohol wipe is individually wrapped, easy to carry and tear off. Alcohol swabs is fast, effective, quick-drying, kill more than 99.9% of germs. Large alcohol prep pads are ideal for all-purpose disinfection, such as electronic products, public doorbell, public seat, etc.